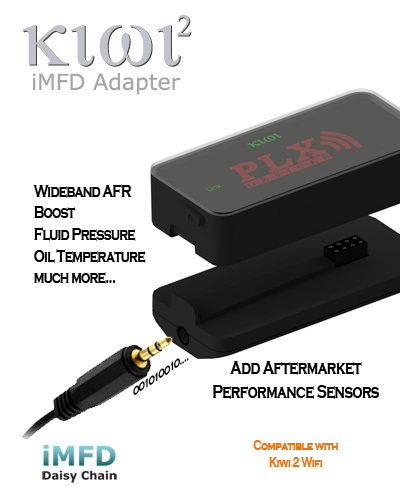 PLX iMFD Adapter is compatible with Kiwi 2 Wifi only. There is 8-pin port on the back of Kiwi 2 Wifi. This adapter connector to that port. Kiwi 2 Wifi, PLX iMFD Adapter and a variety of PLX devices Sensor Modules, on a display of iPod, iPad, or iPhone you can monitor sensor’s data which standard OBD2 doesn’t report. Aftermarket sensors are high performance and designed for speed, accuracy. high resolution and more extreme conditions. Sensor Modules can be added up to 16 modules in any combination (iMFD Daisy Chain). No matter how many sensor modules are added, it won’t affect each sensor module’s performance. They won’t degrade each other. Some popular sensor modules are SM-AFR, SM-Vacuum/Boost, and SM-EGT. SM stands for Sensor Module, AFR for Air / Fuel Ratio, and EGT for Exhaust Gas Temperature. SM-AFR measures precise air / fuel ratio of any combustion engine. It works with gasoline, bio diesel, ethanol, methanol, E85, LPG, and CNG. SM-Vacuum/Boost measures pressure or vacuum in the intake manifold. It is very important information for turbo and supercharged vehicles. SM-EGT measures the exhaust gas temperature or cylinder head temperature of any combustion engine. It measures range from 32 to 1873 degrees Fahrenheit or 0 to 1023 degrees Celsius. Sensor modules are not only for iOS devices, but also for PC via iMFD to PC Link Cable and the world’s most advanced PLX Devices Multi Gauges. And they can be work with third party hardware, too. If you need PLX iMFD Adapter only, click here to get the best deal from an authorized PLX Dealer, fast ship & full warranty! If you get whole products from the scratch, for starter, the combo kit (Kiwi 2 Wifi + PLX iMFD Adapter) is a smart choice.